Of all the things we put up with for beauty, the thing that really gets me is waiting for my nails to dry... It's such a hassle and honestly, who has time for that? I'm always looking for ways to cheat this process, either with quick dry nail polishes or quick dry top coats and while some are great, others can be disappointing. It's also such a hassle if you find a color you really love and it's not available as a quick dry option... For me, that sometimes means I buy it and never use it for fear that my impatience will result in ruined nails. This is where Trind Quick Dry comes in handy! 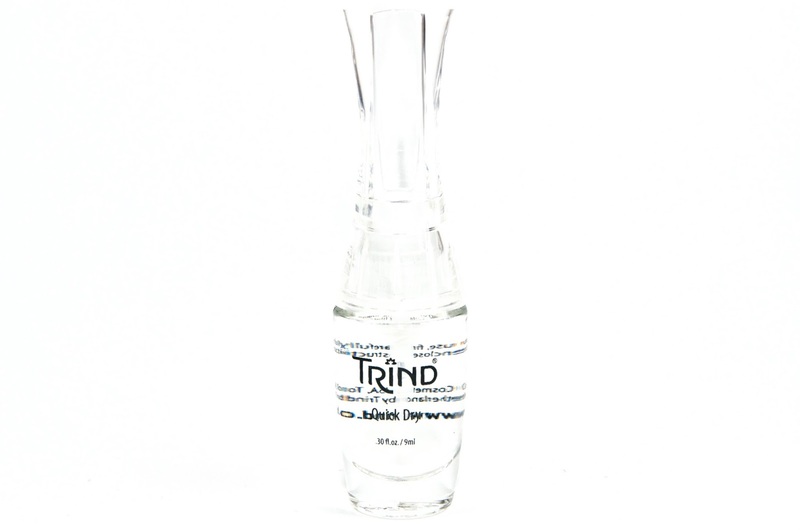 Trind Quick Dry is a clear solution that you paint onto wet nails over your top coat and it starts speeding up the drying process. That's it - it's that simple. I've used it a couple of times now with different polishes and top coats and it works a treat! I always start with a base coat, followed by two coats of polish and a top coat. I then paint Quick Dry on generously and leave my nails to dry. Normally £8.95, Trind Quick Dry is currently reduced to £7.20, which makes it so much more affordable than other quick dry products on the market. It's currently available online via The Garden at www.garden.co.uk.